I captured this image on a very foggy October morning. 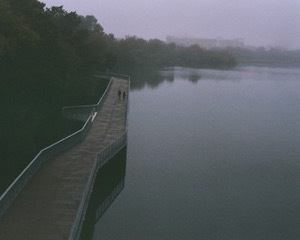 From the interstate, you can see this lovely stretch of the Austin boardwalk. However, this morning it appeared somewhat desolate and separated from the action of the city. The two folks came in to frame as if from nowhere, and this image conveys to me a sense of togetherness occurring simultaneously with a moment of loneliness.